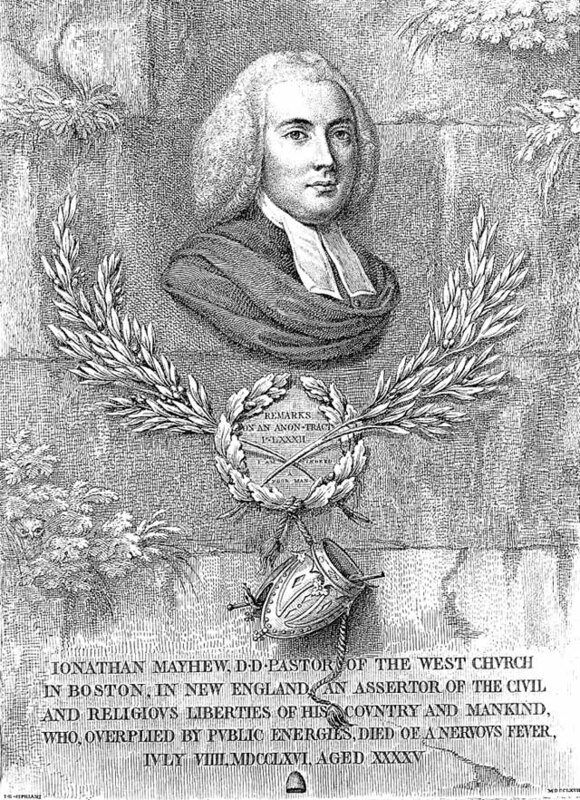 Pastor Jonathan Mayhew of Boston delivered a sermon in 1750 in which he argued that resisting a tyrant was a “glorious” Christian duty. In 1775 the English political philosopher and pro-American Member of Parliament Edmund Burke said, "The religion most prevalent in our northern colonies is a refinement of the principle of resistance: it is the dissidence of dissent, and the Protestantism of the Protestant religion." American Protestants had fled religious and political oppression in the seventeenth century. In the 1760s and 1770s, they called upon that tradition of dissent to cry out against what they considered to be British tyranny. Using primary documents, this lesson aims to introduce students to how the American revolutionaries employed religion in their arguments for independence. There is no simple or straightforward consensus about how religion influenced the philosophical and intellectual ideals of the American Revolution. Historians, in fact, disagree about the significance of religion. The American revolutionaries framed their resistance to England primarily in terms of Enlightenment philosophical principles of natural rights. Despite the fact that the idea of natural rights does not appear in the Bible, such principles were not understood by most American to be contrary to religious belief; indeed, many Americans understood the philosophical arguments for revolution to be supported by their religious beliefs. As one historian, James Hutson, recently wrote, "Religion played a major role in the American Revolution by offering a moral sanction for opposition to the British—an assurance to the average American that revolution was justified in the sight of God." The American people are said to assume the "separate and equal station which the Laws of Nature and Nature's God entitle them"
Certain unalienable rights are said to be "endowed" by the "Creator"
The Declaration concludes "with a firm reliance on the protection of Divine Providence." To the signers of the Declaration, the "Supreme Judge of the world" supported the American cause for independence. But what do we mean by the American Revolution? Do we mean the American war? The Revolution was effected before the war commenced. The Revolution was in the minds and hearts of the people; a change in their religious sentiments of their duties and obligations. While the king, and all in authority under him, were believed to govern in justice and mercy, according to the laws and constitution derived to them from the God of nature and transmitted to them by their ancestors, they thought themselves bound to pray for the king and queen and all the royal family, and all in authority under them, as ministers ordained of God for their good; but when they saw those powers renouncing all the principles of authority, and bent upon the destruction of all the securities of their lives, liberties, and properties, they thought it their duty to pray for the continental congress and all the thirteen State congresses, &c.
There might be, and there were others who thought less about religion and conscience, but had certain habitual sentiments of allegiance and loyalty derived from their education; but believing allegiance and protection to be reciprocal, when protection was withdrawn, they thought allegiance was dissolved. (John Adams, Letter to Hezekiah Niles on the American Revolution, 13 February 1818. Available at the EDSITEment-reviewed site TeachingAmericanHistory.org). Adams's letter reveals that in the minds of many of the American revolutionaries, resistance to political tyranny was understood to be consistent with obedience to God. Religion may not have been the source of all the political ideals of the American Revolution, but for many revolutionary Americans religion animated and supported the cause for independence. Additional background information can be found at the EDSITEment-reviewed online resources "Religion and the American Revolution." Professor Christine Leigh Heyrman's essay titled "Religion and the American Revolution," which is available at the EDSITEment-reviewed site TeacherServe, offers a brief discussion on the "historians' debate" regarding religion and revolution. For a brief but scholarly interpretation of the role of religion in the American Revolution, see Dr. Edwin S. Gaustad's essay "Sins of the Fathers: Religion and the Revolution," which is also linked from TeacherServe. Download the Text Document for this lesson, available here as a PDF. This file contains excerpted versions of the documents used in the three activities, as well as questions for students to answer. Print out and make an appropriate number of copies of the handouts you plan to use in class. What does Romans 13:1–7 teach about political authority and revolutionary activity? How might a revolutionary who followed the teachings of the New Testament interpret Romans 13:1–7? Note: Students will likely note that a straightforward reading of the text would seem to counsel obedience to the law and to those who hold existing political authority and, hence, to be opposed to political revolution. This will help students to place themselves in the difficult position of those American revolutionaries who sought to follow the teachings of the New Testament, yet also chose to overturn the political authorities ruling them. Next, have students read (or choose a student with dramatic flair to read aloud) Jonathan Mayhew's sermon, "A Discourse concerning Unlimited Submission and Non-Resistance to the Higher Powers with Some Reflections on the resistance Made to King Charles I," (1750) which can be found at the EDSITEment-reviewed site TeachingAmericanHistory.org, (A shorter version of the sermon may be found on pages 2–3 of the Text Document). If students find some of Mayhew's terms difficult or unfamiliar, set time aside to explain them. Biographical information about Mayhew and an image of him can be found at the EDSITEment-reviewed site, "Religion and the Founding of the American Republic." Here's an image of the original text of Mayhew's sermon. How does Mayhew's interpretation of Romans 13:1–7 compare to your group's interpretation? Why do you think this sermon, which was originally delivered in 1750, was so influential during the Revolutionary War? Who was Mayhew's audience? Of what importance might time and place of delivery be in our understanding and analysis of this document? Then, ask each group to share their responses through a guided class discussion concerning each question. Provide students (in small groups or one large group) with the excerpt from Thomas Paine's Common Sense found at "From Revolution to Reconstruction," available via the EDSITEment-reviewed resource Internet Public Library. An excerpted version is available on pages 5–7 of the Text Document. According to Paine, what does the Bible say about monarchy? How does Paine explain the presence of monarchies in the Bible? 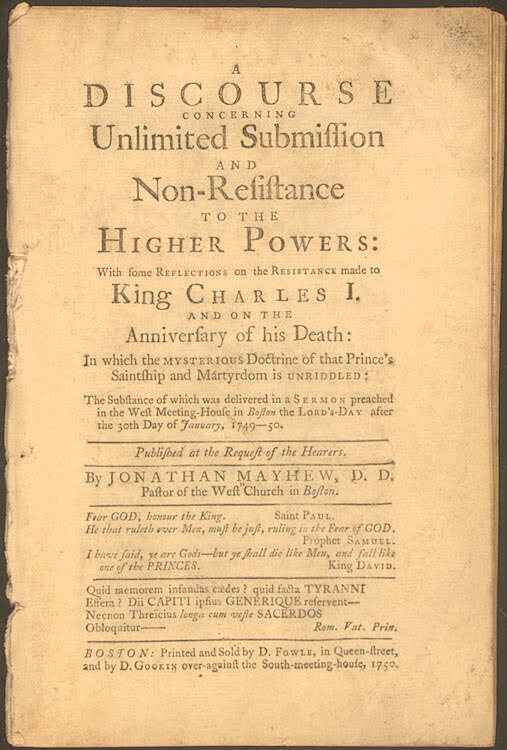 Why does Paine rely on the Bible as a source in his diatribe against monarchy? How effective is Paine's use of the Bible in making his case? Instruct the partners to perform their interview in front of one other set of partners or the entire class. Students who need additional background information regarding Paine might consult From Revolution to Reconstruction available via the EDSITEment-reviewed resource Internet Public Library. For more guidance on how to introduce Common Sense and engage your students in a conversation about its significance and influence, see Professor Christine Leigh Heyrman's essay titled "Religion and the American Revolution," which is available at the EDSITEment-reviewed site TeacherServe. Provide students with the text of the Declaration of Independence, which is available at the EDSITEment-reviewed site of the National Archives. "the Laws of Nature and of Nature's God"
"that they are endowed by their Creator with certain unalienable Rights"
"appealing to the Supreme Judge of the world for the rectitude of our intentions"
"with a firm reliance on the protection of divine Providence"
In a guided discussion, point out to your students (or raise questions that enable students to discover) that these references are non-sectarian—that is, the Declaration of Independence does not invoke one specific religious tradition. Pose the following question: Why do you think Jefferson and the committee that edited his draft wrote the Declaration in a way that invokes religious ideas yet does not ground itself in any one specific religious tradition? Encourage your students to understand that the foundation of the Declaration's statement of "self-evident" truths is open to religious and non-religious interpretations ("nature and nature's God.") In this context, you may find it helpful to introduce the concept of deism, using the information provided in the EDSITEment-reviewed site "Religion and the American Founding". The students should then construct a brief essay responding to the questions: Do Mayhew's sermon, Common Sense, and the Declaration of Independence provide sufficient evidence to support the position that religion was a significant factor in the movement toward independence? Why or why not? If not, what more would be needed to make that case? What difficulties did Romans 13:1–7 pose for American revolutionaries who followed the teachings of the New Testament? How did Jonathan Mayhew deal with these difficulties? Explain how Thomas Paine's Common Sense criticizes monarchy from a Biblical perspective. How and why did Jefferson make reference to a higher power in the Declaration of Independence? For advanced students it may be possible to collapse these questions into a single larger question: Why and how did Americans use religious arguments to justify revolution? Do you find these arguments convincing? Why or why not? How does Adams describe Mayhew's contributions to the revolution? What statements does Adams make regarding Mayhew's character? Explain that John Adams ascribed the success of the revolution to religious factors. Point out that Adams identified Mayhew as having "great influence in the commencement of the Revolution." Help students to see that Mayhew's sermon allowed American revolutionaries who followed the teachings of the New Testament to reconcile their beliefs with their revolutionary activity. Teachers may wish to have their students more closely examine the quote by Edmund Burke included in the introduction to this lesson: "The religion most prevalent in our northern colonies is a refinement of the principle of resistance: it is the dissidence of dissent, and the Protestantism of the Protestant religion." Students may learn more about Burke at the site "From Revolution to Reconstruction," accessible via the EDSITEment-reviewed resource Internet Public Library. They might then be asked, based on what they have learned in this lesson, to evaluate the truth of Burke's statement. "Religion and the American Revolution"
"Divining America: Religion and the National Culture"
"Sins of the Fathers: Religion and Revolution"
Jonathan Mayhew, "A Discourse concerning Unlimited Submission and Non-Resistance to the Higher Powers"
In the middle of the 18th century, a series of evangelical religious revival movements swept across colonial America. By examining primary documents from the time, this lesson will introduce students to the ideas, practices, and evangelical spirit of the First Great Awakening. Using primary documents, this lesson explores how religion aided and hindered the American war effort; specifically, it explores how Anglican loyalists and Quaker pacifists responded to the outbreak of hostilities and how the American revolutionaries enlisted religion in support of the fight for independence. How did religion affect arguments justifying American independence?